As a video processing expert, Analog Way is committed to support its customers through training tailored to individual needs. Whether you are an integrator, consultant or freelance technician, Analog Way offers training that will enable you to take full advantage of our AV processors in various environments. To ensure a more creative and richer user experience, Analog Way has developed training programs for the LiveCore™, Picturall™ and Midra™ series as well as for Vertige™. On site classes and webinars are regularly organized in Analog Way's formation centers and by certified partners worldwide. If needed, on site formations and personalized classes can be planned to match the needs of everyone in Europe, Americas and Asia. Whether you need a first approach to the LiveCore™ environment, or a deep understanding of all features to become a real expert, Analog Way offers trainings that will enable you to achieve your goals. Whether you need to learn how to load media, create cues, or make the best out of its interface, Analog Way offers training that will enable you to achieve your goals. 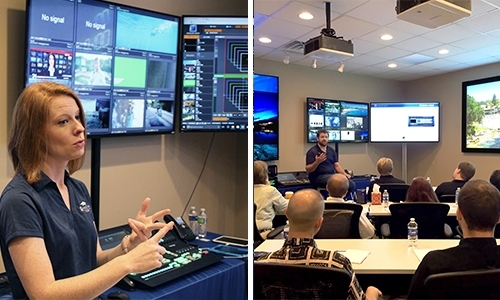 Whether you need to learn how to set up a show, remotely control external devices or make the best out of its interface, Analog Way offers training that will enable you to achieve your goals. This one day training presents the overall functioning of Midra™ switchers, for users who want to operate Midra™ series in widely varying settings. Analog Way's LiveCore™ & Vertige™ Certification Programs are certified by AVIXA’s International's Certified Technology Specialists (CTS). Earn up to 15 CTS renewal units (RUs) when you attend LiveCore™ Advanced 2-day course. Earn up to 15 CTS renewal units (RUs) when you attend Vertige™ Advanced 2-day course. Earn up to 15 CTS renewal units (RUs) when you attend Picturall™ Advanced 2-day course. Earn up to 4 CTS renewal units (RUs) when you attend Midra™ 1-day operator’s course. Click on the links below to learn more about our training and register to the classes.